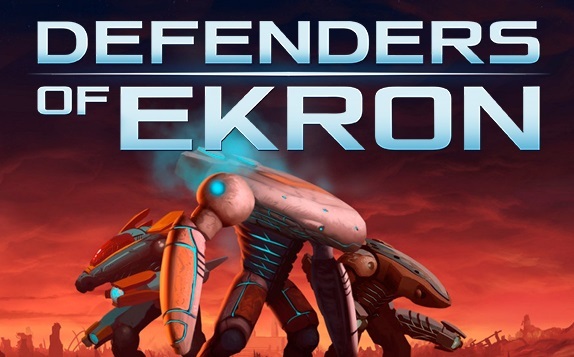 Defenders of Ekron is touted as a shmup game mashed together with an adventure game. I could see the possibility of how that could turn out well, and was interested in trying it out for review. As it turns out, it's more of a twin-stick shooter than a shmup, but that's the least of its problems. The opening level went fine. It scrolls automatically, enemies appear, and you shoot them. Aim with the right stick, shoot with R2. L2 and R2 together made a shield You also have an AI character helping you out. At this point, I was okay. I'm not very good at aiming in twin-stick shooters, but I could deal with it, and made it through the level without incident. Then came the tutorial level. Framed as some sort of VR mission, each part is probably meant to teach the different functions of your ship. It works better if you explain what to do, instead of listing the button to press, and leave it at that. You also can only do the thing they want you to learn. Each section will then add other uses for each function on top of the obvious, but not explain it. The shield can reflect some shots. Fine, that's a nice feature. Oh, but the game requires you to aim the reflected shot back. Ok...I could see that being a cool thing to master, but seems beyond the scope of a beginning tutorial. Ever more so that they want you to reflect multiple shots back at multiple targets that won't be at the original point once you reflect it. So, I was left trying to bounce them back haphazardly, hoping they would connect. It didn't end there. The normal shot can bounce off special beam walls. I don't really see much use of this, nor want it, in a decent shmup (or, in reality, a twin-stick shooter). However, you have to bounce shots to hit switches. To make matters worse, there are beam walls in the way that you have to shoot a switch to change...while the first shot is bouncing around. It's not just one and done, either. The beam walls in the middle must be changed back and forth a few times, with pin-point precision, to hit one of the switches on the other side. Again, this is ridiculous to put in a beginning tutorial...I wouldn't even want to have to do that at any point in the game. I ended up just spamming shots while quickly switching sides to shoot down the bouncy corridor while changing the switch until the shots hit where they needed to on the other side. I think the game wanted you to master a complex thing, but spamming worked in the end. Neither of those should have to happen. I should also mention that shooting either the normal shot (R2), the (hard to) aim shot (L2), and the shield all require your mech's energy. The shield makes sense, but having your normal shot take energy feels like a bad idea. Every so often you have to stop and wait for it to refill, which isn't near as quick as I'd like. I'm not a fan of letting go of the shot button for a second to collect medals and such, let alone having to do it for 5+ seconds to fill up my energy. Having to take my eyes off the action to check the lower corners of the screen for my health or energy is not what I want to do while trying to dodge tons of shots from random angles. The story takes place over several different levels. There are different sections to these levels, such as auto-scrolling parts, exploring parts, and boss fights. You only have the one life, so it's game over if you run out of health. Thankfully there are checkpoints, but there really needs to be more of them. Unfortunately, they also record your current health, so crossing a checkpoint with little to no health isn't going to help you much. Story-wise the length of levels makes sense, but some go on a bit too long for my taste. I also don't like being shot so much from off-screen. You can't directly repeat the story missions, only do them again in the simulator. This is only for scanning the enemies, since you don't earn any Oxus to upgrade your mech from doing them again. Besides the story levels, there are drills that are like challenge stages, tasking you with (somehow further) mastering your various vehicle functions. You get a small amount of Oxus for completing the drill, but can obtain more by fulfilling extra goals in each one. There are three possible challenges that each grant extra Oxus upon successful completion of the drill. If you somehow manage to do all three in a single try, you get a gold star. Some of the challenges, like the "ammo" ones, I was able to complete. Others, like the dodging ones are just not possible for me. Unfortunately, you can only get so far like that. I did appreciate the extra Oxus so I could actually upgrade my mech and complete the first stage though. The base's hangar is where you spend your collected Oxus to buy upgrades. Effects from some upgrades, like the attack power and speed, are hard to notice. Upgrading the health seems to be the best, as it has a big effect on your survivability. The Oxus can also be used during missions to heal your ship, or go into a berserk mode, with stronger and faster shots. While an interesting idea, I don't like having to sacrifice my long term viability (upgrades) for temporary benefits. Since you won't get any from replaying any stages, there is a finite amount you can gather. I've needed to use the heal, but was always very reluctant to do so. There should be a better way to use the capabilities of the vehicle without hurting yourself in the long run. When it comes down to it, there are three possibilities. One, the game isn't very good. Two, I'm not good at the game. Or three, a combination of the first two. I'm going with the latter as the most likely. If you like mastering a game before you can do anything, unforgiving and cheesy difficulty, and twin-stick shooters, then Defenders of Ekron might be for you. Anyone else should stay far away. Eastasiasoft has stated that there are some improvements with the physical release, including an 'easy' mode, which may alleviate some of the issues I have with the game. I don't think that would affect the drills, which is one part where I would want an easy mode. Still, I can update this review when and if the patch hits the digital version, and see if my opinion changes. I appreciate that they tried to meld two genres together. Slams you with a massive skill wall in the first 10 minutes. The shield is supposed to be good against energy attacks...but not fire? Do they not know what fire is?